Hundreds of thousands of Virginians are dealing with a serious mental illness. Many more a dealing with some sort of mental behavioral, or emotional disorder. Virginia communities are being torn apart by addiction. Thousands are dealing with mental illness and addiction from behind bars in Virginia’s jails and prisons. These are real problems for our Commonwealth that demand real solutions. In order to be able to address these issues, the Commonwealth must have response, care and treatment system that is organized and coordinated. To date, the Commonwealth has been unable to meet that challenge. Rather, the legislature, governor, cabinet, agencies, nonprofits and private sector have proposed different ways to address the mental health issues facing Virginia and not a unified solution. This has created decision paralysis at all levels, resulting in many Virginians not receiving the care they need at the most appropriate place and time. Virginians struggling with mental health issues, addiction or who are in recovery do not neatly fit into secretariat or agency organizational charts. Any Virginian who has needed mental health or substance use disorder treatment or intervention, knows the system – or lack thereof – is not working for all Virginians. Our mental and behavioral healthcare safety net is inadequate, falling far short of what our most vulnerable citizens deserve. 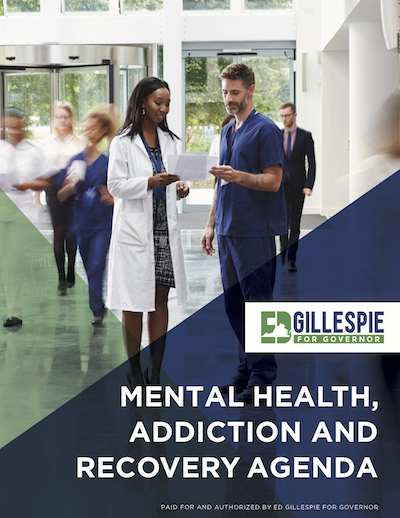 The challenge for Virginia’s next governor will be to strengthen our mental and behavioral health services and address the crisis of drug addiction that is sweeping across every community in every region of our great Commonwealth. Virginia cannot wait for the Federal Government or other states to solve this crisis. We should set the standard for other states to follow. As governor, Ed Gillespie will work with Republicans and Democrats in the General Assembly to implement a comprehensive plan to ensure alignment across all agency and partner organizations. Either way you look at it: from serving individuals and families or ensuring the best use of taxpayer dollars, the overwhelming research compels us to focus on intervention, before crisis occurs. Crisis is destructive to families and individuals. Crisis costs more and takes longer to stabilize. Virginia’s behavioral health system must ensure Virginians have access to high quality care when they first need it. To accomplish this, we must develop and fund community based systems of care to help our fellow citizens before they fall into crisis. There are many dedicated and caring professionals working tirelessly on all ends of behavioral health. In order to serve them and our fellow Virginians who find themselves working through the complex web of behavioral health and addiction treatment, we must take action to de-silo our structures and move toward solution oriented systems. As governor, Ed will work to improve our behavioral health system to ensure individuals receive the care they need. He will work with healthcare and law enforcement experts to develop a comprehensive solution that addresses all facets of the addiction crisis, including prevention, intervention, treatment and recovery. If we do this right, we can save lives and improve treatment options and outcomes. Doing so will result in a healthier and stronger Commonwealth, which will ultimately save taxpayer dollars over the long term. We must proactively pursue reform and realignment of our behavioral health care system rather than continue waiting for the next crisis to serve as a catalyst for change. Click here to download a printer-friendly PDF of the plan. Addiction affects nerve function and brain chemistry. Scientific evidence clearly indicates that long-lasting brain changes are responsible for the distortions of cognitive and emotional functioning that characterize addiction, including the strong compulsion to continue drug use. Addiction acutely modifies mood, memory, perception, and emotional states that can persist long after the individual stops using them. Too often, our behavioral health system as a whole seems to lurch from one crisis to the next. We must work together to provide care and treatment at the first signs of problems, for the individual and the system as a whole, rather than wait for the next crisis to dictate our response. Likewise, our criminal justice system should not be one of Virginia’s leading treatment centers. We must continue to improve our ability to divert nonviolent offenders suffering from mental health or addiction into treatment rather than jail. Often addicts enter the criminal justice system not through a possession charge, but through a crime committed to feed their addiction. It will require an investment of time and resources in community-based services to solve this problem. The emerging consensus from health practitioners and law enforcement leaders is a shared belief that addiction is clearly a public health issue more than a criminal justice problem. Law enforcement representatives are searching for creative alternatives to divert the afflicted to needed treatment in lieu of incarceration because the prison system is not the appropriate venue to treat those who struggle with addiction. Already stretched law enforcement, judicial resources and overcrowded jails cannot become a substitute for meaningful treatment. Managing an increasing population suffering from addiction under such an approach is not sustainable. Moving forward, strategies to combat addiction must address stigma, administrative barriers and state capacity to provide wider access to treatment and counseling. When someone facing addiction is in crisis and asks for help, we must respond immediately. For those facing addiction, one week can mean the difference between entering recovery or continuing a harmful addiction. Educate our middle and high school students, teachers and parents about recovery from addiction. Designate a long-term recovery person in a senior role to provide guidance on reforming the system of care in our communities across Virginia and identifying breaks in the recovery system. Reform funding mechanisms to ensure that existing funds can be rapidly deployed. Work with Virginia’s health plans to ensure treatment services are covered. Work to expand same day services for recovery from substance use disorders and co-occurring related disorders. Virginia should strive for same day admission to recovery residence, medication assisted detox, admission to inpatient or outpatient treatment. Ensure those struggling with addiction and mental or behavioral health diagnosis have access to care in the community or in a hospital or other treatment facility if no appropriate community service is available. Encourage the use of navigators to assist front-line nonprofits and other charitable institutions who help individuals seek treatment. Develop a coordinated plan to ensure children entering the Foster Care System due to the crisis have appropriate care unique to their needs. Encourage collaboration between Virginia’s criminal justice system and authentic recovery communities to help those struggling with addiction. Ensure any Virginians on probation or parole can seek help in obtaining treatment through their probation or parole officer without fear of further prosecution or incarceration. Encourage recovery-oriented systems of care (ROCS) through the Department of Corrections and during a prisoner’s reentry to society. Encourage the establishment of additional drug courts. Reform drug laws to ensure penalties align with the crime committed. Despite considerable public awareness of the nation’s prescription opioid and heroin addiction epidemic, over a thousand Virginians died last year due to prescription opioid and heroin overdoses, a significant increase over the previous year. In fact, there are now more deaths associated with drug overdoses than car accidents. The opioid addiction epidemic has two pathway drivers – non-medical use (abuse) and medical use (overuse) of prescription opioid drugs. Access to prescription opioids and illegal drugs is readily available in communities, schools, workplaces and in home medicine cabinets, making them available for medical overuse or abuse. Strategies that fail to address non-medical use and medical overuse will be incomplete. The General Assembly and the current Administration have enacted numerous measures to combat this epidemic. But, we can all agree, much more needs to be done. Direct the Virginia Department of Education to produce model program materials to aid school division leaders in their effort to address opioid drugs and their dangers. Train our teachers and administrators to identify the signs and symptoms of opioid addiction among our student population and identify treatment programs available for their students. Direct the Secretary of Education to conduct outreach through Virginia’s High School League (VHSL) coaches to enlist the coaching community in sharing opioid risk information among athletes exposed to such drugs after a sports-related injury. Encourage our higher education system to assist students in recovery or those struggling with addiction through the opening of sober dorms and collegiate recovery programs. Building from Delegate Todd Pillion’s legislation, Ed would work with medical schools to expand and strengthen curriculum for the treatment of pain. The Centers for Disease Control developed in March 2016 voluntary opioid prescribing guidelines for chronic pain. Upon issuance of these prescribing guidelines, the CDC declared, “Overprescribing opioids—largely for chronic pain—is a key driver of America’s drug overdose epidemic. The guideline will give physicians and patients the information they need to make more informed decisions about treatment.” More needs to be done to widen the use of prescribing guidelines, especially beyond chronic pain treatment into prescribing for acute pain conditions. Continuing the efforts of the General Assembly, Ed would direct his Secretary of Health and Human Resources, working in consultation with Board of Medicine, Board of Pharmacy and relevant stakeholders to continue deploying best practices and provide guidance regarding best practices for the prescribing opioids. Virginia utilizes a Prescription Monitoring Program (PMP), which is an electronic database to track prescribing and dispensing of controlled substances, meant to be used by prescribers, pharmacies, and other law enforcement and health officials. Some states have responded to the overdose epidemic with enhanced policies around PMP use that can help prevent overprescribing, abuse, and diversion and to inform prescribers of their opioid prescribing patterns. Virginia should strengthen its PMP reporting to better identify those who may be abusing opioids and physicians who may be overprescribing. Ed would work to increase the use of the PMP to track prescriptions for controlled substances, inform clinical practice, and protect patients at risk. Changes should focus on making the Virginia PMP easier to use and access by providing data more timely and expanding and improving proactive PMP reporting to identify and address inappropriate prescribing patterns. Work with leaders to improve prescription monitoring in methadone and suboxone clinics. Currently, the PMP does not apply to methadone and suboxone clinics. During its 2015 legislative session, the General Assembly passed a Safe Reporting law, which encourages those present at an overdose event to make a call to emergency or law enforcement personnel. Virginia’s law still subjects those present and making a call for assistance to potential arrest for a variety of specified infractions. Ed will work with law enforcement and relevant stakeholders to modify Virginia’s Safe Reporting law to an improved Good Samaritan law. Good Samaritan immunity laws provide protection from arrest and prosecution for witnesses who call 911. Currently, Virginia’s policy only protects the caller from arrest and prosecution for simple drug possession, possession of paraphernalia, and/or being under the influence. Exceptions would be included to ensure that dealers continue to be held accountable. If a victim or caller rejects offered treatment they will forfeit immunity. According to the recent US Surgeon General’s report on the nation’s opioid addiction epidemic, only one in ten people suffering from Substance Use Disorder receive meaningful treatment. Clinical data supports the use of evidence-based treatment involving a number of medications that demonstrate higher recovery rates from opioid addiction than traditional abstinence-only approaches. Ed will work to ensure access to evidence-based treatment for those who are or may become addicted to opioids. He will work to ensure that treatment options are expanded according to leading research and medical expertise. For far too long behavioral health has been isolated from physical health – in treatment and through state government silos. We must do more to ensure that mental health is connected to the whole of Virginia’s health care system. As governor, Ed Gillespie will evaluate potential realignment of Virginia’s community-based services at the Department of Behavioral Health and Developmental Services (DBHDS) and the Department of Medical Assistance Services (DMAS). DMAS is currently the primary payor for many of Virginia’s community-based services. Ensuring DMAS coordination with community-based programs will better align funding and oversight for community-based services. It will also permit the DBHDS to enhance focus on the operation of Virginia’s mental health facilities, fulfilling the Commonwealth’s responsibilities under the settlement with the Department of Justice, the sexually violent predator program and a stringent licensure program to ensure Virginians in search of treatment receive high-quality care. More important than government efficiencies, this will improve the continuum of care for Virginians working within the behavioral health system. We can no longer allow organizational silos to force Virginians into a maze of government bureaucracies and service providers to get the care they need. We also must take action to reform our systems approach to behavioral health. Our Community Service Boards (CSBs) have done what has been asked of them, but often that has meant doing more with less. This results in a system that does not provide care equally or with the same high standards from one region of the Commonwealth to the next. In some cases we see points of pride and success, and in other cases we see inconsistent service and care. 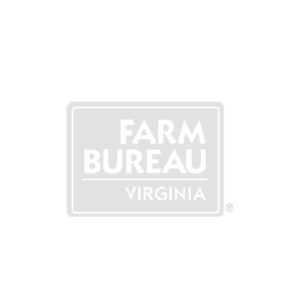 It is important to note that CSBs are in this situation through no fault of their own. Pursuing consistent high quality care while retaining the flexibility that comes with local control is central to Ed’s plan. As governor, Ed will work with the General Assembly and localities to create a regional system for CSBs to collaborate, share best practices and work together to ensure all Virginia residents receive the high quality care they deserve. The governing body of the regional system will keep the executive and legislative branches apprised of its efforts and will make recommendations for strengthening our CSBs. 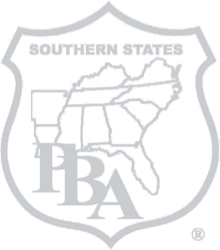 This regional management approach to our Community Service Boards will ensure excellence. The core principle of this transformation will be to ensure high and consistent quality while maintaining local control. A regional, systems approach with local leadership is a patient-centered formula for success. Virginia currently operates two Medicaid managed care programs. Virginia Medicaid Managed Care, known as the Medallion program, is now Medallion 3.0. The next iteration of the Medallion managed care program will be Medallion 4.0, which will be implemented in 2018. The second is Commonwealth Coordinated Care Plus known as “CCC Plus,” is a statewide Medicaid managed long-term services program being implemented over the next several months. Once CCC Plus and Medallion 4.0 are successfully implemented, Virginia should explore improving alignment between the Medallion program and CCC Plus to ensure greater efficiency for the benefit of all Virginians, including those in need of services along the behavioral health continuum. As governor, Ed will work to set long-term strategy to better coordinate Medicaid managed care programs to reduce duplication and improve services and coordination. This patient-centered approach is right for Virginia. In order for our behavioral health system to provide a true continuum of care, we must ensure our incentives are properly aligned. To date, we have disincentivized primary care physicians from helping those with behavioral health problems from seeking care. We must create a system where dollars follow the patient. Virginia has successfully implemented the “Money Follows the Person” concept to ensure appropriate services are available for those transitioning from an institutional setting to a community setting for care. We need to expand this concept to allow state and federal funds to follow individuals in the community who are seeking mental health or substance use disorder treatment. As governor, Ed will direct his Secretary of Health and Human Resources to develop a resources strategy to include legislative, regulatory and executive action that will allow resources to follow the patient in the community, whether seeking mental health or substance use disorder treatment. Virginians in need of mental health or substance use disorder treatment do not fit neatly in one Secretariat. Accordingly, Ed will continue to roll out policy ideas to address these important issues over the coming weeks. In addition, Virginia’s behavioral health system touches many different Virginians across secretariats and Ed will roll out policy ideas specific to these populations in the weeks ahead.